Only two platforms seem to have survived on the corporate market. Google Android and iOS by Apple take the joint lead. Both systems are good for 43 percent of the corporate smartphones provided as seen by Smart Profile at the approximately 2500 corporate branches interviewed. 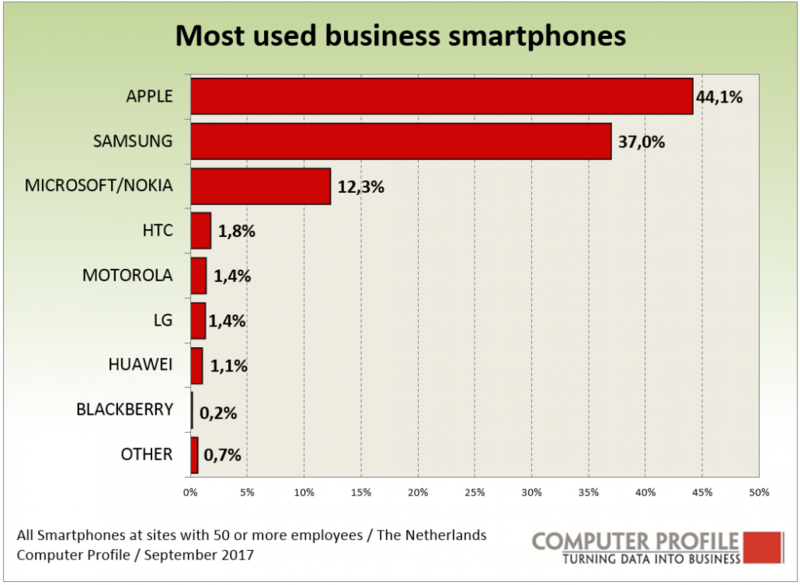 Symbian has since dropped to a market share of 1 percent, new Blackberry smartphones are running Android and appliances using the Blackberry OS have since virtually disappeared. It now also seems as if Microsoft has withdrawn from the market for mobile telephony. In 2016 there were only a few new smartphones using the Windows 10 platform and in 2017 none at all. Unless a new platform appears or Microsoft breaths new life into the smartphone proposition, we are quickly heading for a dual system: either you have an iPhone or an Android phone. There are, incidentally, still more company locations with iPhones than company locations with corporate Android appliances. Around three quarters of the locations state that there is one or more iPhones in use. For Android phones, this percentage of corporate locations is 56 percent. Because there is greater price diversity among Android appliances than iPhones, the number of smartphones per location is clearly higher than iPhones, so that ultimately the number of corporate appliances are at the same level for both platforms. Apple is also the most prevalent smartphone brand. Around 44 percent of the smartphones we encounter are an Apple phone. This percentage deviates slightly from the percentage of smartphones running iOS. That should be the same. 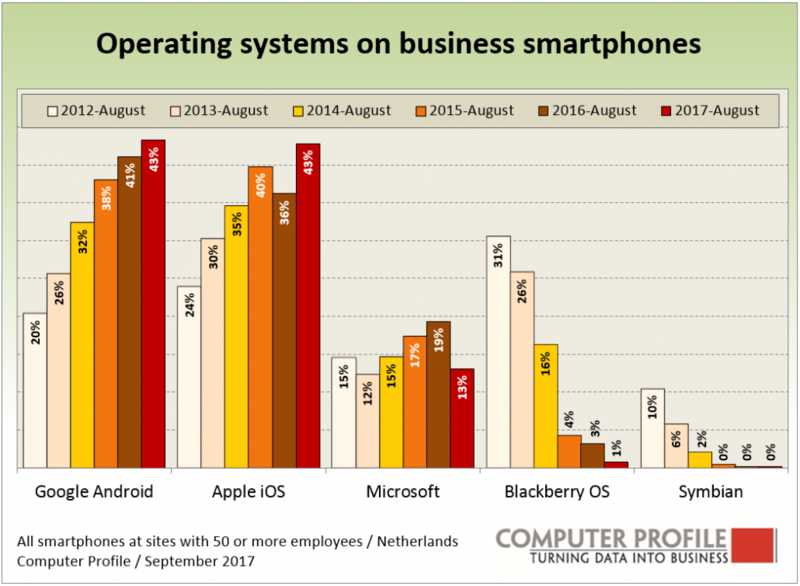 The difference is because several companies know which platform the smartphones in use are running but are unable to break down fully the brands of those smartphones. This “don’t know brand” is excluded from the calculation in the graph below. The share of iPhones at government institutions is the highest; more than half of the catalogued smartphones are an Apple. The share of iPhones is the lowest in the care and education sectors, with 16 and 19 percent of the total respectively. Samsung accounts for 37 percent of all smartphones. Samsung has the highest share in the care sector with 61 percent and in education the lowest. In the education sector we see a number of large institutions with a high number of smartphones from Microsoft/Nokia. All other manufacturers of smartphones together have a share of less than 2 percent. For a number of years, Smart Profile has mapped, in addition to the use of smartphones, also the use of Mobile Device Management. Based on the interviews held during the past 9 months, the use of this application is mentioned at about a quarter of the company branches with 50 employees or more. The use of software for mobile device management is clearly higher in the public area and at locations of Multinationals, both characterised by relatively large locations, than with national enterprises (250 to 2500 employees) and medium-sized companies (50 to 250 employees). In recent years, a clear growth in the use of this solution has emerged. Remarkable in this context. In Belgium, we have mapped the use of mobile device management in a similar way. In the Netherlands we see a strong growth, but we hardly see this at all in Belgium. 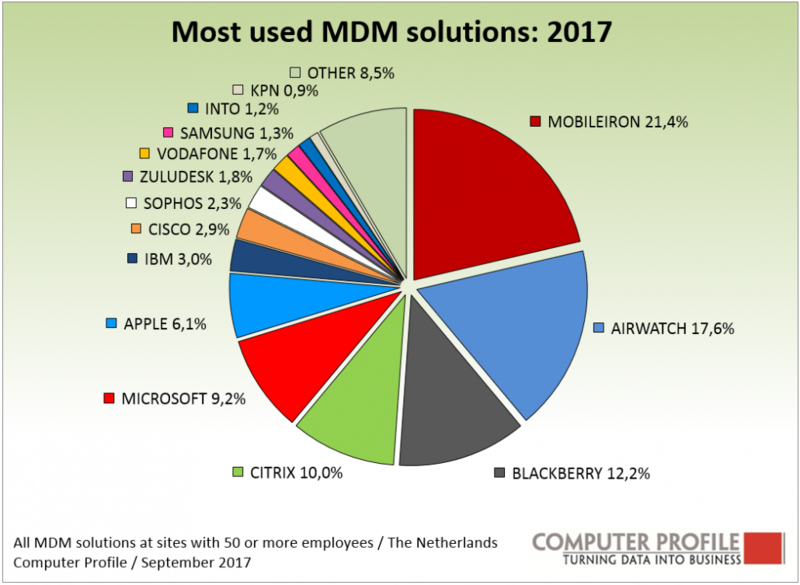 If we look at all the solutions for mobile device management encountered, we see that Mobilelron is the most prevalent application, just like last year. The share of Mobilelron seems to have declined slightly. Most other vendors have enjoyed a small rise in their share compared to last year. The most important exception to this appears to be Microsoft Intune. They have seen a growth of a number of percentage points compared to last year.